THIS IS AN EXQUISITE DRESS FROM THE ART NOUVEAU ERA. THIS DRESS DATES TO ABOUT CA 1910 - 1915. IT IS A "WALKING" DRESS. IT IS MADE OF 100% PURE SILK. THE DRESS HAS SO MANY SEAMS. IT IS VERY FITTED AND TAILORED. IT HAS SMALL PUFFED SLEEVES, A HIGH COLLAR WHICH TIES INTO A SIDE BOW, LARGE BUTTONS WHICH RUN ALL THE WAY DOWN THE FRONT PAST THE WAIST, AND A HUGE SWEEP IN THE SKIRT FINISHED OFF WITH HUNDREDS OF KNIFE PLEATS ON A SAGE GREEN SILK RUFFLE. THE DRESS IS SO ELEGANT YET CHEERY AND ALMOST WHIMSICAL. 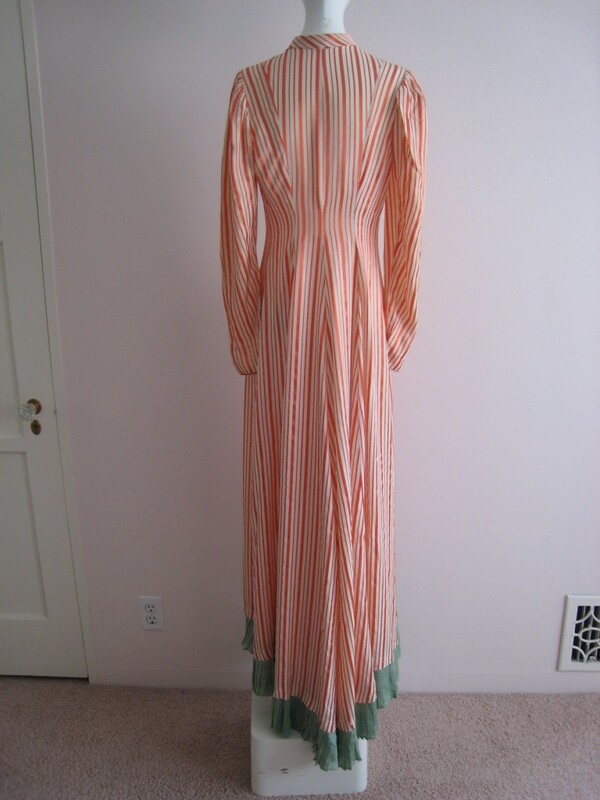 THE SILK IS PRINTED WITH TANGERINE COLORED STRIPES AGAINST A CREAM GROUND. THE RUFFLE ON THE BOTTOM OF THE DRESS IS DONE IN A SAGE GREEN. THE CONDITION IS VERY GOOD VINTAGE. THERE ARE TWO HOLES THAT I FOUND. ONE IS A "HEEL" HOLE IN THE SILK PLEATED RUFFLE. I HAVE PICTURED THIS FOR YOU. IT COULD BE FABRIC TAPED FROM BEHIND OR STITCHED. IT WILL NEVER BE SEEN WHEN THE DRESS IS WORN. THE OTHER HOLE IS IN THE SAME AREA IN THE SAME GREEN SILK RUFFLE. IT IS SMALLER, AND I HAVE PHOTOGRAPHED IT FOR YOU ALSO. THE REST OF THE DRESS IS IN REMARKABLY FINE CONDITION. THERE ARE NO UNDERARM STAINS AND NO OTHER RIPS OR HOLES. THERE ARE NO STAINS ANYWHERE ON THE FABRIC. THE DRESS HAS LONG SLEEVES WHICH COME TO A PLAIN HEM WHICH DOES UP WITH SNAPS. THE FRONT OF THE DRESS HAS HOOKS AND EYES WHICH RUN FROM THE NECK TO BELOW THE WAIST TO DO THE DRESS UP UNDERNEATH THE BUTTONS. 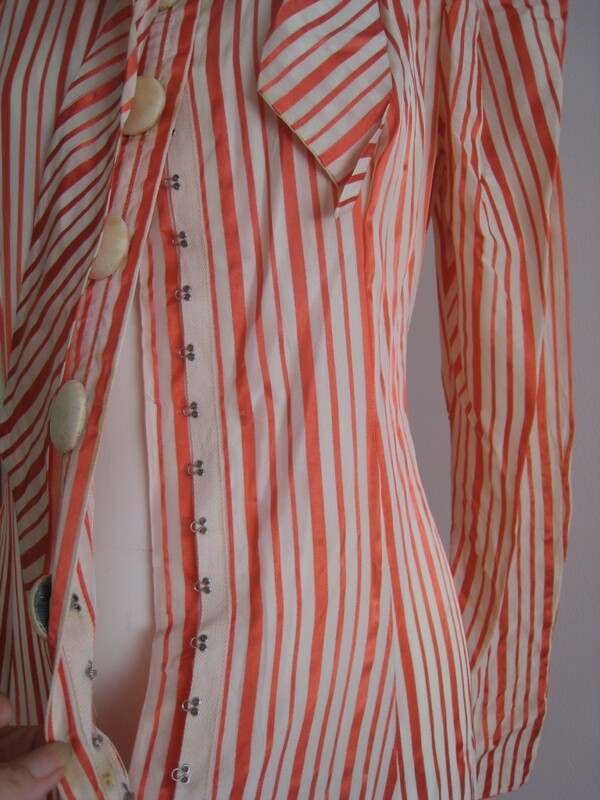 SOME OF THE BUTTONS HAVE SLIGHT WATER MARK STAINS ON THEM WHICH IS VERY HARD TO SEE. YOU HAVE TO SEARCH TO FIND THEM. A COUPLE OF THE BUTTONS ARE STARTING TO SEE SOME VERY SLIGHT SHATTERING OF THE SILK. THIS IS BARELY NOTICEABLE. THE MEASUREMENTS TAKEN LAID FLAT ARE: SHOULDER TO SHOULDER 13 5/8THS" SEAM TO SEAM, BUT JUST INSIDE THE PUFF OF THE SLEEVES WHICH IS ACTUALLY THE TRUE MEASUREMENT IS 15". BUST: 15 1/2", WAIST: 13 1/2", HIPS: 19". LENGTH OF DRESS FROM NECK TO HEMLINE IN THE FRONT IS: 55". FROM THE NECK TO THE HEM IN THE BACK THE DRESS MEASURES 63". THE SWEEP OF THE DRESS IS VOLUMINOUS. IT MEASURES 190". 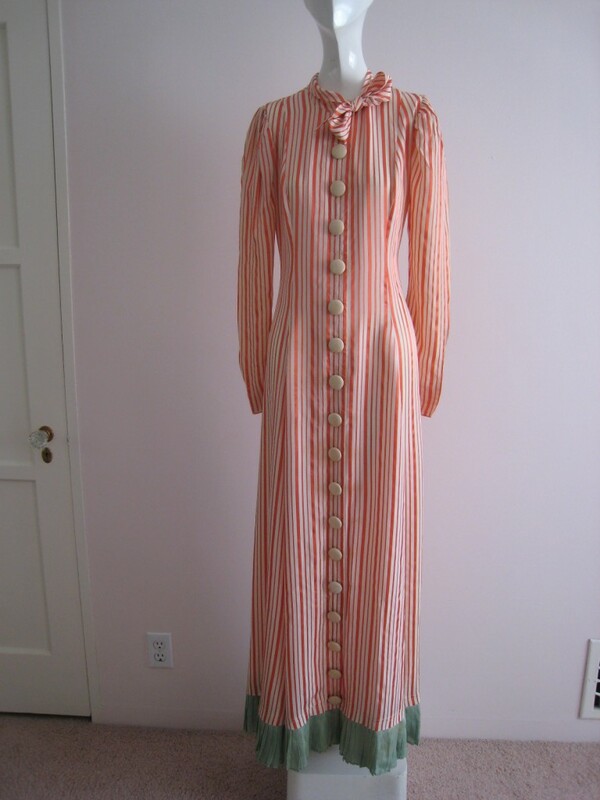 THIS IS A RARE EDWARDIAN DRESS. The skirt is too long and the cut is all wrong for teens era. Instead, this looks to be about a decade earlier. 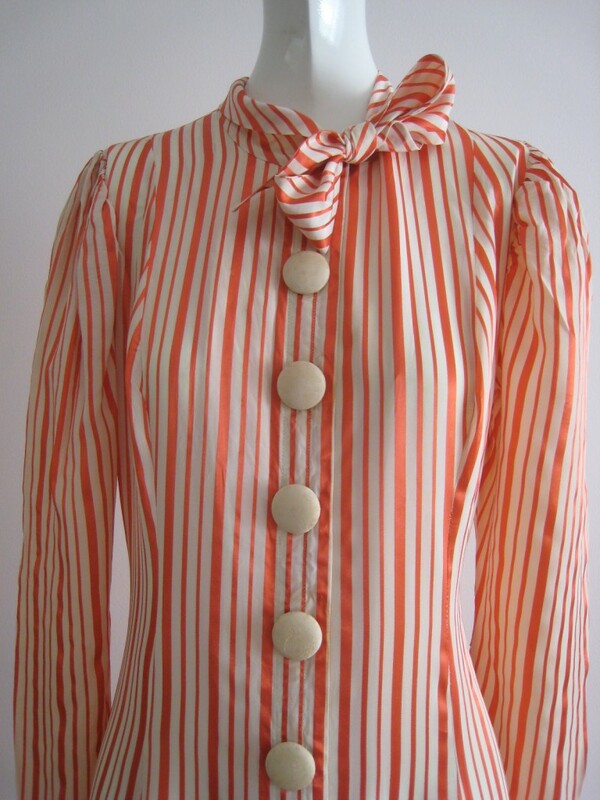 Imagine it with a s-bend corset and it looks radically different and more appropriate for the 1900's. The reason I wanted to showcase this one, however, is simply because I swear, cut off the bottom half of the skirt, and you have a "Mod" style dress. 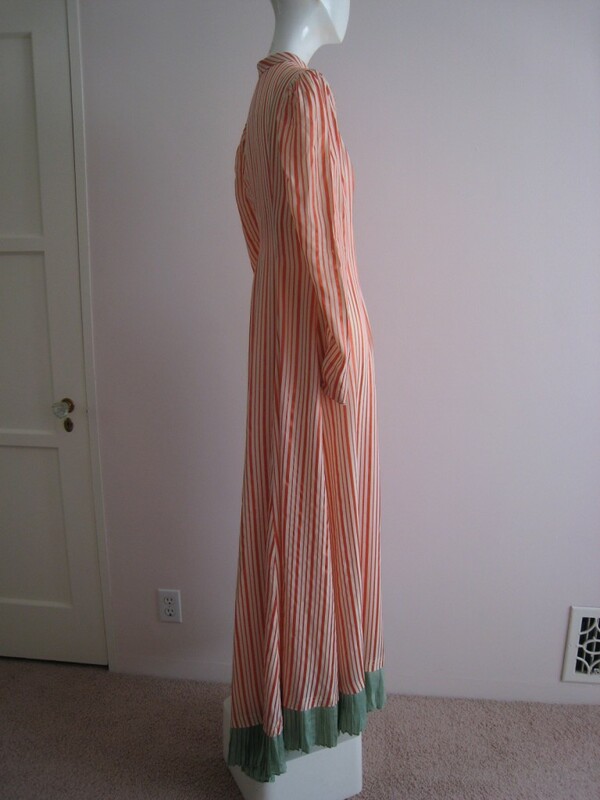 It would suddenly look very late 1960's/early 1970's if the hem were the right length from the front. Sleevils! from the 1890's and a half decade! Merry Second Day of Christmas! Pink and Purple 1920's Dress with matching hat! Stripey! 1890's Bodice and black skirt. Cutest Plaid 1860's Wrapper Evah!